Dr. Carr is currently finishing a draft of a book on the world history of swimming, tentatively titled Swimming, Slavery, and the Silk Road. 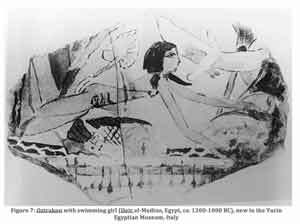 She asks why, when almost everybody in the world was a good swimmer in the Bronze Age, more than half the people in the world today do not know how to swim. Her answer is that non-swimming people from Central Asia - first the Indo-Europeans, then the Turks and Mongols - have slowly spread out over the world, and they've brought their fear of the water with them. The book shows how the Greeks of archaic Athens learned to swim, how the people of medieval Europe and China suddenly stopped swimming, and how people all over Early Modern Europe were so unfamiliar with swimming that they floated witches to prove their guilt. When Spanish and British colonizers met swimmers in the Americas and Africa, they dismissed swimming as the sort of thing animals could do. And yet, when a swimming fad swept Europe after Lord Byron swam the Hellespont in 1810, these same colonizers forced people of color out of the water, and claimed the beaches for themselves. Professor Carr would be delighted to have you read a chapter; if you're interested, drop her a line. Dr. Carr is also in her second decade as a Roman pottery specialist for the Leptiminus Archaeological Project, working in the modern village of Lamta, in Tunisia. Leptiminus was an important Roman port, and the excavation is one of very few from the Roman Empire to have excavated the kilns where Roman pottery and amphorae were made, soon to be filled with fish sauce (garum), wine, or olive oil and shipped all over the Roman Empire and beyond. The survey material has already been published in the Journal of Roman Archaeology, and the team is now working to process the much more abundant excavation material. Dr. Carr writes and publishes a children's encyclopedia of history and science, History for Kids, which has been serving tens of thousands of children every day since 1995. With more than two thousand pages, History for Kids is now a major resource for middle school students all over the world, and has won numerous awards, including the Encyclopedia Britannica's Web's Best Sites award for 2009. Dr. Carr is currently working on a sister site for college students and interested adults, which will be called Quatr.us. Dr. Carr is also the founder and long-time president of Portland's society of the Archaeological Institute of America. The AIA has been sponsoring these lectures in dozens of locations all over the United States and Canada since 1884, as well as providing scholarships to archaeology students, funding excavations, and advising the US government and army regarding archaeological preservation. The Portland Society presents six to eight free public lectures on archaeological topics every year on Portland State campus. To get on the mailing list for lectures, once again, drop her a line. Dr. Carr is also the longtime webmaster of CAPN, which organizes an annual conference every March for historians, archaeologists, philosophers, and philologists working in the ancient Mediterranean. She is pleased to announce that the 2017 CAPN conference will be hosted at Portland State! When she's not involved in historical or archaeological projects, Dr. Carr is also the founder and organizer of the PDX Free Store, an offshoot of Occupy Portland. We hold monthly gatherings where anybody can come drop off or pick up household goods, clothing, toys, plants, and books. Everyone is welcome; no need to donate in order to take things home. A free lunch is provided.